Bill and I had slept in a high camp in Navajo Basin after climbing El Diente Peak and making the traverse to Mount Wilson the previous day. We had arranged to meet a new friend at the Rock of Ages saddle that morning to make an ascent of Wilson Peak's standard route, the West Ridge. As of late 2004 this route and the Rock of Ages saddle are on a private mining claim and are closed to hiking. Hike at your own risk and try to minimize your exposure on this route and approach. We had hiked into a high camp at 12,700' feet in Navajo Basin via the Silver Pick basin approach over Rock of Ages saddle. 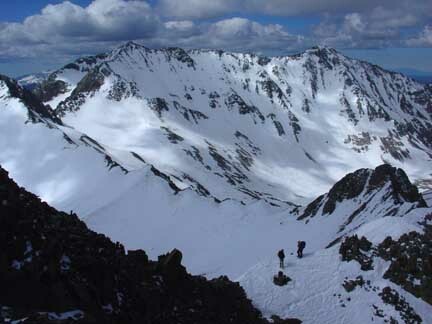 From there we took the standard west ridge route to Wilson Peak's summit. BEEP,BEEP,BEEP was the sound of our watch alarms filling the tent at 4:30am. Much too early and much too cold in June to be considered civil but no one ever accused mountaineers of being civil. It was just below 20F degrees outside at our high camp at 12,700' in Navajo Basin. We had to get moving as we were scheduled to meet Dan at 5:00am at the Rock of Ages saddle to climb Wilson Peak with him. Putting on our cold and damp clothes and boots from our previous day's climb of El Diente and Mount Wilson, we were out of the tent by 5:10am and on the saddle by 5:25am. No sign of Dan yet so we turned on our FRS radio to give him a call and check on his status. He was down in Silver Pick basin near the stone house and could see my headlamp. He was a little later than he'd anticipated but well on his way and he would be up at the saddle in 15 minutes. We figured as much though as the snow was icy and tricky on the approach from the trailhead so we expected the delay as was evidenced by our 25-minutes-late arrival at the saddle. Bill and I did everything we could do to stay warm as our watches read 22F degrees and there was a slight windchill on the saddle. We also enjoyed a beautiful sunrise that has the clouds in the sky glowing a pinkish-orange and nicely illuminated the summits of Gladstone Peak, Mount Wilson and El Diente Peak. Sunrise on Mount Wilson and the ridge to El Diente Peak seen from Rock of Ages saddle. After a long 15 minutes, Dan arrived at the saddle around 7:30am after having some altitude-sickness issues on the ascent to this point. But he was feeling much better now and ready to head for the summit. At this point we noticed another climber with skis on his back making his way up towards the northwest snow route on Wilson Peak. I commended him for doing it the completely legal way as we stood smack in the middle of a mining claim on top of the Rock of Ages saddle and our ascent route for the day would be almost entirely done while trespassing. 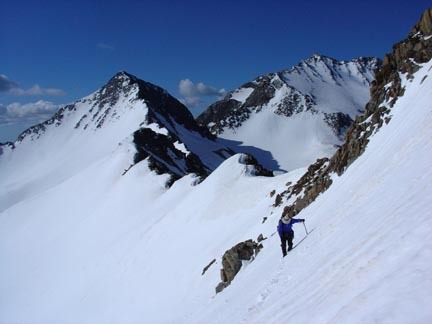 The three of us made good time along the softening snow slope traverses past the Gladstone-Wilson ridge to the West ridge proper. Dan traversing the snow slope with Gladstone Peak and Mount Wilson Peak in the background. Dan told us of the baby he and his wife are expecting in about three weeks and confessed this would likely be his last mountain trip before the baby's birth. Dan only had six more 14ers on his completion list and if we were successful on Wilson Peak, he'd be down to five. Once along the ridge we were making good progress and enjoying the warm, clear and still day. We had picked a beautiful day for our climb! We reached the 13,900' false summit without issue but it appeared the final 100' vertical to the summit would be interesting. Dan and Bill stand on the ridge just west of the 13,900' false summit of Wilson Peak. From the false summit the route drops down and to the ridge's north side. The north side was filled with snow and loose rock. Bill and I made our way down and into the snow without issue but this section had Dan thinking. He confessed he was not scared only thinking responsibly regarding the impending birth of his first child. The three of us talked it over and Bill and I offered to help point out holds and good steps. Dan decided he could take it slow and steady and get through it. Once he began, he had no trouble at all and within 30 minutes, we all stood on the summit taking in the expansive view of the neighboring high peaks of the San Juans. We could see Dallas Peak, Mount Sneffels, Wetterhorn Peak, Uncompahgre Peak, Rio Grande Pyramid, Sunlight Peak and the Mount Eolus'. The air was still and warm, a perfect summit! We took a few photos, ate and then began our descent. 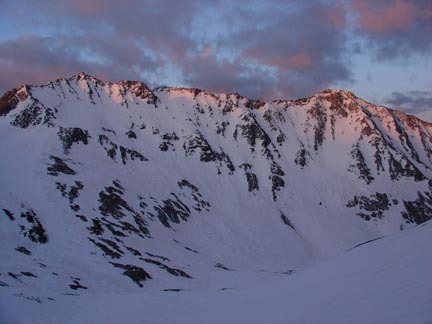 The lone climber/skier we had seen earlier in the day had summitted just before us and was sitting atop the northwest couloir waiting for the snow to soften before making his descent. We asked if he minded a jealous audience and his reply was, "Not at all!" We told him to leave his e-mail address on our car at the trailhead so that we could send him photos of his descent. He was a tele skier and a good one at that and was gone in moments making nice turns all the way down into the lower Silver Pick basin. Envious of his turns, we continued down the ridge in soft snow without incident back to the Rock of Ages saddle. Dan took a break and began his descent back to the trailhead while Bill and I packed up our tent and followed after Dan. 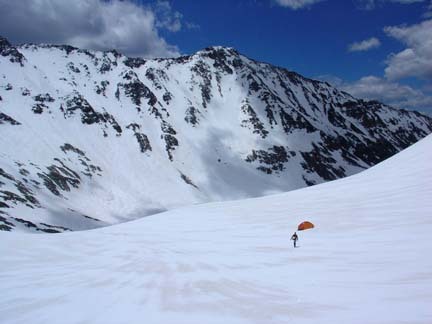 Returning to our tent after another wonderful and successful trip in the beautiful mountains of Colorado. We had numerous nice glissades on the descent and were back at the cars without issue or confrontation with "basin patrollers" by 2:30pm. 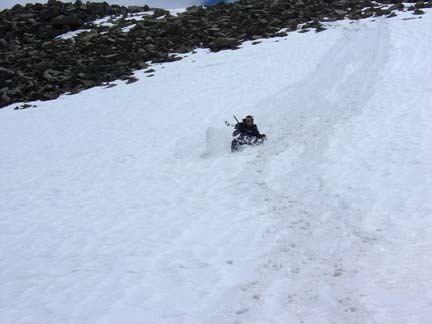 Dan enjoying some of the fine glissading to be found in Silver Pick Basin. Dan and Bill were excited to have completed the Wilson group 14ers on their second attempts and we were all very pleased with the outing with new friends. It was a pleasure to meet Dan and share an outing with him. Dan has five 14ers to complete his quest while Bill has four remaining for his quest. Written by Jason Halladay on 06 June 2005.